The 5th edition of Edison Awards had a festive impact across the ambience of Chennai with film industry’s most happening celebrities walking on red carpet to receive the honours. The ceremony was emblazoned with the humorous treat by Chitti Babu and Pinto, son of famous actor Pandu… They played perfect host indeed. The show commenced with a surpassing dance performance that fancified the entire auditorium of Lady Andal School with Torch Lights. Name them and they’re were there. The celebrities ranging from Ilayathalapathy Vijay, Harris Jayaraj, and Jeyam Ravi to everyone in the industry, it was a moment of celebration that had impact much more than the release of the movies. 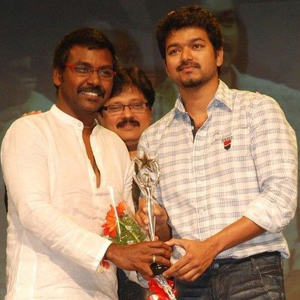 Actor Vijay spent more time over the dais winning the honours and felicitating Raghava Lawrence for Extraordinary Performance and Ravi for Best Romantic Hero. He didn’t miss to sing praises of these personalities, especially on Raghava Lawrence saying that his son Sanjay often imitates his performance in Kanchana. Richa Gangopadhyay won the first appreciation through Edison Awards for her mind-boggling performance in Mayakkam Enna. ‘I am really thankful to Selvaraghavan for giving me an opportunity to perform this role’.